in 2 x 2 rib worked in the rnd on smaller needle. One size: fits approx head circumference of 21 - 24 inches (53 - 61 cm). Ribbed brim is stretchy. This intermediate pattern is worked in the round from the bottom up. Instructions are written and charted. 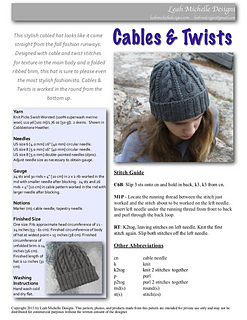 Pattern requires 2 skeins of KnitPicks Swish Worsted (shown here in Cobblestone Heather), or approximately 200 yards of any worsted weight yarn. Finished measurements: Finished circumference of body of hat at widest point = 15 inches (38 cm). Finished circumference of unfolded brim is 14 inches (36 cm). 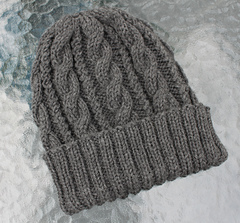 Finished total length of hat is 12 inches (31 cm). Skills required: knitting in the rnd, cabling with a cable needle, increasing, decreasing, stitches used: knit, purl, RT, C6B, k2tog, p2tog.